Céad Míle Fáilte , “A Hundred Thousand Welcomes” from McDonough Construction, Inc.
We are a family owned construction company based on beautiful Beaver Island, Michigan since 2005. My parents were born and raised on Beaver Island and started their family on the island. However, I was born and raised in Grand Rapids, Michigan (the youngest of 15 children). 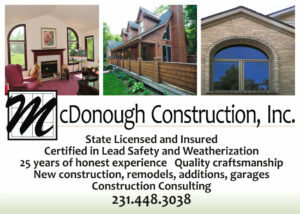 I found my love for building in high school and eventually formed McDonough Construction Inc. in 1992. We are happy to be celebrating 25 years in business! In a twist of fate, I found myself working and living where my ancestors did and decided to move my wife to Beaver Island. We have continued our family on Beaver Island and have a 5th generation McDonough (daughter) living on the 150 year old family property. McDonough Construction has worked on projects costing from hundreds of dollars to multi-million dollar projects. Plenty of them in between. There is no project too big or too small for our company. I feel that not only can we handle your building needs, we can tackle the logistical issues that arise while living and working on an island. A mentor of mine coined the phrase, “WE ARE A CAN-DO COMPANY”! This phrase continues to stay with me as I operate my own company. Our goal is to have satisfied customers left with an exceptional finished product. We look forward to serving the Beaver Island community, Charlevoix County and beyond.